Rapid advances in microelectronic integration and the advent of Systems-on-Chip have fueled the need for high-level synthesis, i.e., an automated approach to the synthesis of hardware from behavioral descriptions. SPARK: A Parallelizing Approach to the High – Level Synthesis of Digital Circuits presents a novel approach to the high-level synthesis of digital circuits — that of parallelizing high-level synthesis (PHLS). This approach uses aggressive code parallelizing and code motion techniques to discover circuit optimization opportunities beyond what is possible with traditional high-level synthesis. This PHLS approach addresses the problems of the poor quality of synthesis results and the lack of controllability over the transformations applied during the high-level synthesis of system descriptions with complex control flows, that is, with nested conditionals and loops. Also described are speculative code motion techniques and dynamic compiler transformations that optimize the circuit quality in terms of cycle time, circuit size and interconnect costs. We describe the SPARK parallelizing high-level synthesis framework in which we have implemented these techniques and demonstrate the utility of SPARK’s PHLS approach using designs derived from multimedia and image processing applications. We also present a case study of an instruction length decoder derived from the Intel Pentium-class of microprocessors. This case study serves as an example of a typical microprocessor functional block with complex control flow and demonstrates how our techniques are useful for such designs. 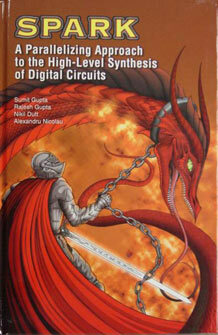 SPARK: A Parallelizing Approach to the High – Level Synthesis of Digital Circuits is targeted mainly to embedded system designers and researchers. This includes people working on design and design automation. The book is useful for researchers and design automation engineers who wish to understand how the main problems hindering the adoption of high-level synthesis among designers.